Title: BNsf Lowline local heading to Ayer Jct. Description: Don't argue with me where I took the photo!!! Description: A geep pauses on Front Street as it switches the docks where 86 foot sticks of rail are loaded onto flat cars. 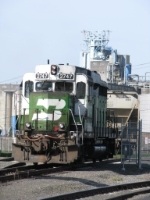 Title: BNSF2747 GP39E at cement transpher center. 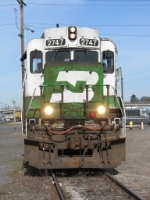 Title: BNSF2747 I got a face wash! No more "Jolly Green". Title: BNSF2747 GP39E 3tank cars and BN12179 in Vancouver WA. Description: Active GP30s! WOW! Well they look like GP30s on the outside. Their new guts are GP39s. The middle unit is a GP38-2. 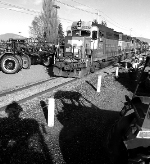 We're at Burlington, WA (just north of Everett) on 7/23/2011 doing local switching on a Saturday. Description: Well, I guess its don't fence me out...please. Description: BNSF 2747 leading BNSF 2078 north in a mini-power move. Description: BNSF 2747 bringing some green into the Pacific Northwests excuse for fall colors, crossing below the block lights.